Jean-Baptiste Monnoyer (French, 1626-1699 ), a painter, designer and engraver, created many prints like this work, Plate 10 from Set of Flowers in a Basket which is dated to 1680. Early flower prints were primarily used for botanical textbooks, but by the end of the seventeenth century, they were considered a higher artistic medium. Prints like this work would have been etched and then colored by hand and often re-purposed for wallpapers, toiles and chintzes. 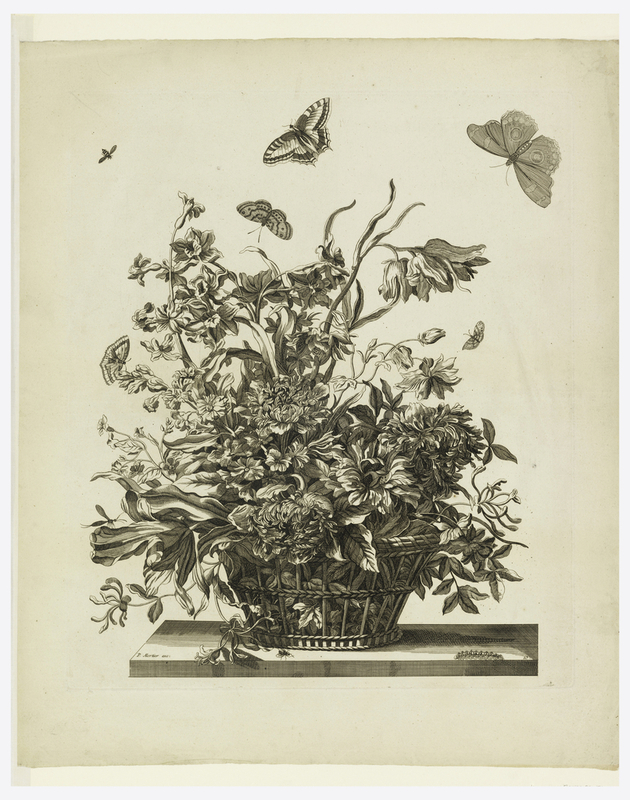 In Plate 10, peonies, tulips, narcissi, and anemones overflow from the basket, while four butterflies and other insects surround. The detail and delicacy of the flowers display Monnoyer’s dexterous skill with both the medium and the subject. Each petal and leaf is distinct, allowing the viewer to recognize the unique natural forms and immerse himself in the flora. Monnoyer often mixed autumn and spring flowers in his designs, seemingly unconcerned with the realism of their synchronicity. These combinations create a magical, effervescent semblance, reflecting the lighthearted, fluid motifs that emerged out of the early Rococo era. Jean-Baptiste Monnoyer first gained recognition when he was received at the Académie Royale in 1663. He was quickly renowned for his mastery of botanicals and began to collaborate with the Royal painter and designer Charles Le Brun (French, 1619-1690) at the Gobelins workshop, a Parisian textile factory owned by King Louis XIV. Monnoyer assisted Le Brun on decorations at several palaces including the Royal Châteaux Meudon and the Grand Trianon at Versailles. The French interior became increasingly salient due to the patronage of Rococo designs and decorative arts and because of Monnoyer’s finesse, he frequently contributed floral borders to tapestries and interior paintings. Many of these large works are unfortunately not signed, however Monnoyer’s enchanting, delicate engravings give us insight into his influential engagement with nature and decoration. Lily Gildor is a candidate in the MA History of Design and Curatorial Studies program offered at Parsons The New School of Design jointly with Cooper Hewitt, Smithsonian Design Museum. She is a Master’s fellow in the Drawings, Prints and Graphic Design department. Leona E. Prasse, “The Donald Gray Memorial Collection of Flower and Fruit Prints,” The Bulletin of the Cleveland Museum of Art 27, no. 4 (April 1940): , accessed September 27, 2016, http://www.jstor.org/stable/25140845. “Jean-Baptiste Monnoyer,” The Illustrated Magazine of Art, 1853, accessed September 27, 2016, http://www.jstor.org/stable/20538173. Lesley Stevenson. “Monnoyer, Jean-Baptiste.” Grove Art Online. Oxford Art Online. Oxford University Press, accessed October 6, 2016,http://www.oxfordartonline.com/subscriber/article/grove/art/T059167.